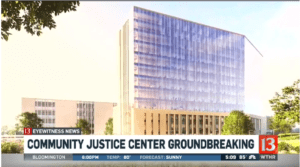 INDIANAPOLIS (WTHR) – City and neighborhood leaders took part in the ceremonial groundbreaking for Marion County’s new Community Justice Campus Thursday morning. The $571 million project is going to be built on at the site of the former Citizens Energy coke plant on the southeast side of Indianapolis. The campus will house a 3,000-bed jail, a new courthouse, the sheriff’s office and an Assessment and Intervention Center. Brenda McAtee, president of the Twin Aire Neighborhood Coalition, was among those who spoke at the groundbreaking. McAtee, who has been a neighborhood advocate for years, said she was “proud to be part of the festivities and eager to see the investment” in the area. Eyewitness News later joined McAtee and two other longtime residents at McAtee’s home just a few blocks from the construction site. They all stressed the project wasn’t a shoe-in, that the neighborhood approved it by a single vote. “When you put ‘criminal’ on it, everyone says, ‘Oh no! A jail! But it’s not just a jail’,” McAtee said. Flinore Frazier, 89, who was born and raised in the neighborhood, was among those who initially opposed the justice center. “I’m not sure sure what changed my mind but comparing the negative to the positive, the positive won out,” Frazier said. A large part of that? The assessment and intervention center aimed at helping those with mental illness and addictions, issues that have challenged the Twin Aire neighborhood and so many others. “So many people don’t belong in jail. They need a chance… see what’s wrong with them. Maybe we don’t know everything they’re going through,” McAtee said. “You see the need and we need the supply,” Frazier said of places to assess and treat people with mental health issues and/or addictions. The women are also glad to see the 140-acre plot, fenced off for more than a decade, put back in use. 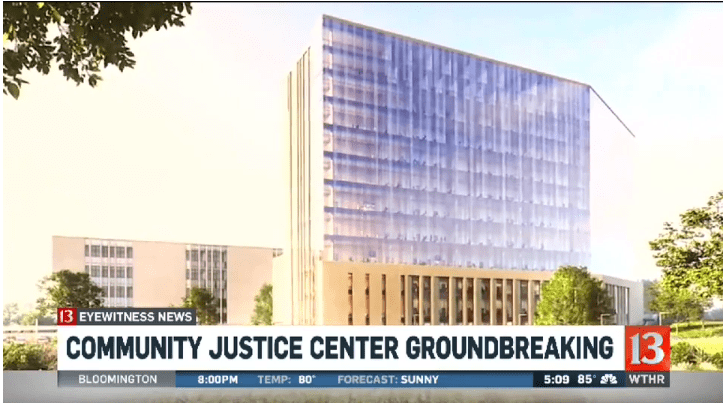 “As the Community Justice Campus develops, businesses around it will develop and that means lots of jobs,” said Ann Holy. “I think it’s good for the community and the whole southeast side. It’s going to be a beautiful thing for everybody. It’s a win win,” McAtee said. The center is expected to open in 2021, but the transition, getting people moved in, could continue into 2022.